There is a bit of silver color loss on the backs. (I can't see it with the naked eye, but it shows in the photos.). 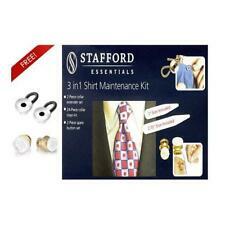 FULL SET WITH THE BAR AND SCREW FOR EACH COLLAR TIP INCLUDED AS PICTURED. COLOR: BRASS. QUANTITY: 2 PIECES (PAIR). These are done in gold plate and are unworn. A nice addition to any western wear. Magnets are nickel coated and durable. Excellent sticking ability that will last because they are Neodymium. 2 1/4" LONG COLLAR STAYS FOR SPREAD COLLAR SHIRTS. 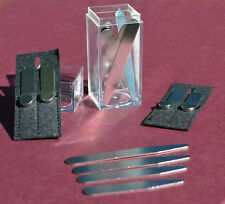 Set includes 10 COLLAR STAYS (10 pieces) WITH 10 MAGNETS. 2 1/4" LONG COLLAR STAYS FOR SPREAD COLLAR SHIRTS. 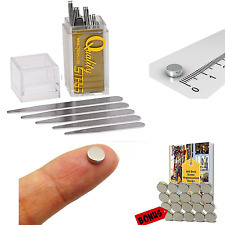 Magnets are nickel coated and durable. Excellent sticking ability that will last because they are Neodymium. 2 1/4" - 57mm long - perfect for SPREAD COLLARS. VINTAGE SILVER TONE HORSE SADDLE WITH RHINESTONES COLLAR TIPS USA MADE. Condition is Pre-owned. Shipped with USPS First Class Package. Estate find - unknown exact age and origin. 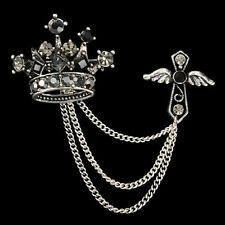 We try to describe every item to the best of our ability and show the object from several angles with clear photos. Vintage solid slightly aged brass screw in cube collar bar findings. One of the cubes can screw off and on. 4 x 52mm. 6 pieces. Hers have scrolls and flowers, and are 7/8" high x about 7/8" wide (opening at collar). Not sure if her pieces are sterling, as no pieces are stamped sterling or. 925. Color of the real item may be a little bit different due to factors such as lighting / monitor resolution etc. make Supersized seem small. Color : Silver. Get images that. This is a lot of 34 cloth collar stays. 6 are 2 1/2" long; 10 are 3 1/4" long; 18 are 3 3/4" long. See all the photos. 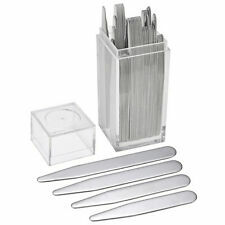 10pcs 73mm Collar stays Bone. 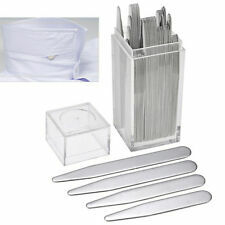 10pcs 67mm Collar stays Bone. 10pcs 61mm Collar stays Bone. 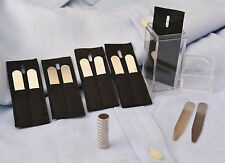 10pcs 54mm Collar stays Bone. Material : Stainless Steel. They are made from stainless steel and are strong and durable. SORRY ABOUT REFLECTIONS IN PICTURES STONES ARE VERY CONSISTANTIN COLOR REDISH BROWN. 2 match and the extra is silver. This is a lot of 12 wider plastic collar stays. See all the photos. 1 pair is marked McGregor. See all the photos. The dancing couple seems pretty rare. The attached decoration is a couple bowing before/after a dance. The backs have screws for attaching to collar. I don't know if this can be made more silver with cleaning, which I have not tried. Vintage Western Metal Collar Tips Pair Silver Tone Gold Dancing Couple 1.75"
Here we have a Vintage Western Metal Collar Tips Pair Silver Tone Gold Dancing Couple 1.75" long. The dancing couple are in a gold to e while the rest of the tips are silver tone.l with Etched designs. Thanks for looking. The sharp Collar is a new-patented design that combines collar stays with a supporting strip around the entire collar. The flexible strip, the sliding stay and the adjustable angles of the collar stays will make this device fit most shirt sizes, allowing it to be adjusted to your desired look. The pair weighs a total of about 8 grams. These classic Navajo pieces add a Western or cowboy look to any shirt. 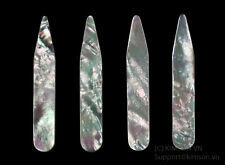 Up for sale is ONE (1) pair of Mother of Pearl Collar Stays Stiffeners from BARNEY'S NEW YORK. Inventors: Italo Rotondo (Providence, RI) and Warren Dontigney (North Scituate, RI). Patent 24652769, Filed: October 15, 1984.